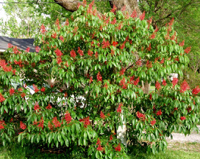 Aesculus pavia, Red Buckeye: This almost tropical looking shrub-like 10-20′ x 10-20′ tree is a hummingbird magnet when its red, tubular flowers are in bloom in mid-spring. It prefers fertile, moist soils in full sun to part shade, but tolerates clay soil. It appreciates shady conditions protected from the late afternoon sun. 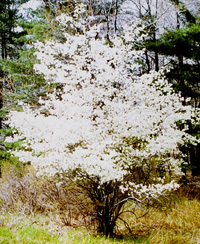 Amelanchier, Serviceberry: There are many species of the graceful Amelanchier and they are typically beautiful in both spring and fall, with white flowers in early spring and later red, orange and yellow leaves in fall. This small tree, and sometimes shrub-like tree, depending on the species, prefers moist soils in sun to part shade conditions. It can a range of soils. It offers edible berries in early summer. 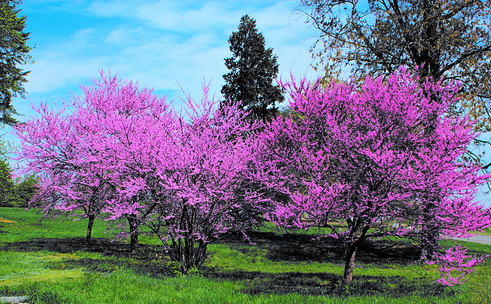 Cercis canadensis, Eastern Redbud (pictured above): This 15-30′ x 20-35′ tree puts on a vibrant display of rose-purple flowers in mid-spring. It prefers average, well-drained soils and is adaptable to either sun or shade. It is typically deer resistant and attractive to butterflies and bees. 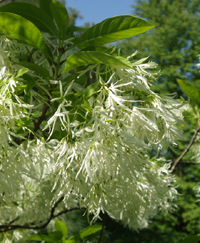 Chionanthus virginicus, Fringetree: This unique 15-30′ x 15-30′ tree produces airy, fringe-like flowers in late spring and nice yellow fall color. It is easily grown in rich, moist, and even clay, soils in sun (with protection from late afternoon sun) to part shade. It adapts to urban conditions, but doesn’t like to dry out. It is a larval food source for the Rustic sphinx butterfly. Learn more from my “Must-haves for the Best Butterfly Garden” post. Cornus alternifolia, Pagoda Dogwood: This 15-25′ tall x 20-30′ wide, layered looking tree offers white fragrant flowers in late spring which give way to bluish bitter fruits on reddish stems providing food for wildlife in fall and winter. It also offers nice burgundy fall color. It prefers cool, moist soils in part shade conditions. It tolerates poor and clay soils and has little problems with disease or deer. It also provides a larval food source for the Spring Azure butterfly. 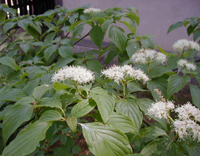 Cornus florida, Flowering Dogwood: This 15-30′ x 15-30′ tree provides showy pink or white flowers (technically not flowers, but bracts) in early-to-mid spring, then offers bright red, inedible fruit loved by birds. Its leaves turn a beautiful scarlet red in the fall. 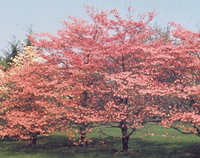 It prefers full sun to part shade conditions and tolerates most soils, but is more susceptible to disease than the Pagoda Dogwood. It will grow under black walnut trees and is also deer resistant. This dogwood is a larval food source for the Spring Azure butterfly, as well. 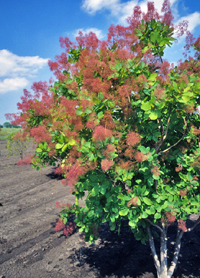 Cotinus Obovatus, American Smoketree: This unique 15-30′ x 15-30′ tree has a smokey appearance in late spring when the pinkish, fine-textured petioles attached to the spent flowers develop. Its beauty continues into the fall with yellow, red, orange and reddish purple leaves. It prefers poor, rocky soils, but is adaptable to other types of soil. It is drought tolerant and disease resistant too. Crataegus, Hawthorn: The many species of Hawthorns grow to 25-35′ with a wide-spreading crown. 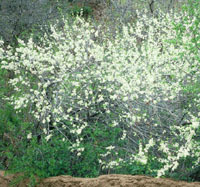 They offer clusters of pretty white flowers that later bear red fruit that persists into winter. Hawthorns typically like dry to moist, well-drained soils in sun. True to their name, they do have thorns. Halesia carolina, Carolina Silverbell: This lovely tree grows to about 30-40′ x 20-35′, and it’s delicate, drooping white flowers are showy in early/mid-spring. Nut-like fruits appear in the fall, along with yellow leaves that drop early. Silverbells prefer moist, organically-rich soils in part shade. Magnolia: The native species include M. acuminata (Cucumbertree), M. fraseri (Fraser Magnolia), M. grandiflora (Southern Magnolia-evergreen), M. macrophylla (Bigleaf Magnolia – 2 1/2′ long leaves! ), M. tripetala (Umbrella Magnolia) and M. virginiana (Sweetbay or Swamp Magnolia-evergreen in southern regions, pictured here). 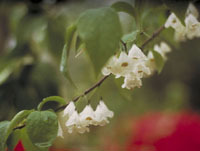 They range in size from about 25′ to 80′ tall and offer large, creamy whitish flowers. 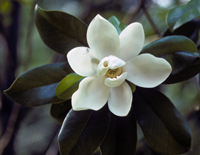 Most Magnolias prefer moist, well-drained soils and do well in sun and shade. 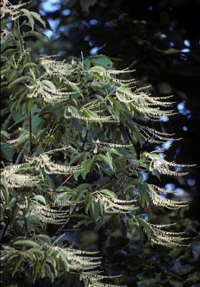 Oxydendron arboreum, Sourwood: This narrow 20-25′ tall tree produces delicate, slightly fragrant white flowers in early summer and deep red leaves in fall. They prefer moist, organically rich, well-drained soils in full sun. Sourwoods have a special value to bees and their honey from this tree is sought-after. They tolerate deer, but not urban pollution or drought. 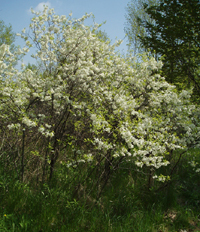 Prunus americana, American Plum: This thicket-forming 15-20′ x 15-20′ tree offers odorous white flowers in early spring which give way to edible fruit (great for jams & jellies) in early summer. It’s easy to grow and adaptable to a wide range of conditions in sunny locations. Just pull out any unwanted suckers to prevent it from spreading too much. Prunus pensylvanica, Pin Cherry, Wild Red Cherry: This 25-40′ x 20-35′ tree offers four seasons of interest with clusters of small, white flowers in mid-spring, bright red edible fruit (great for jellies) in summer, intense fall color in shades of red, orange and yellow, and shiny bark. It does well in average to dry, rocky/sandy soils in full sun. It attracts birds & butterflies, but may be damaged deer and beavers. Just a note on where to purchase these trees…Reputable nurseries and online resources are your best bet, not the big box retailers. Also, check out your local native plant society in spring and fall.